Cambridge, Mass. – April 27, 2015 – One is headed to India, another will spend the year in Poland, and the third will be in Colombia. 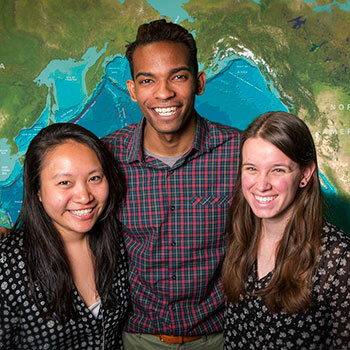 This summer, after completing their studies at Harvard School of Engineering and Applied Sciences (SEAS), three graduating seniors will begin year-long fellowships as part of the Fulbright Scholars program administered by the U.S. Department of State. For Joy Ming ’15, notification from the Fulbright board has meant setting aside plans to start a job as a software engineer for Google in New York City. Instead, she’ll be traveling to India to work on a project that will assess the usability of a new mobile app designed to smooth the collection of maternal health data in hospitals and clinics. She’ll be based in Bangalore but will conduct field work in rural regions across the vast subcontinent. It won’t be Ming’s first stint in India. Following her freshman year, through Harvard’s Weissman International Internship Program, she spent a summer interning at a nonprofit in New Delhi researching how community health workers manage critical patient information. “I was able to see how the technology I was learning in shiny classrooms with new computers was able to help people on the ground where paper is the only thing they have; they don’t even have electricity most of the time,” Ming said. The experience inspired her to start the student-run organization Developers for Development (D4D). Today, D4D is a thriving campus group, sponsoring term-time projects, hackathons, internships, and meet-and-greet opportunities for students interested in social impact technology. When Tyreke White ’15 travels to Poland at the end of the summer, it will be the South Carolina native’s first time outside of the United States. Rather than project-based, his Fulbright year will be spent as a teaching assistant at a university, in either Warsaw or Krakow. “My role will be to help students with English language and grammar skills and to be a cultural ambassador,” White said. In addition to his classroom duties, he will run English language and culture clubs. The assignment is a good fit for White’s long-term aspirations and effusive personality. He has served as an academic mentor at the Ed Portal, Harvard’s Allston-based partnership with the city of Boston. He also served two years as a teaching fellow for math 21a (multivariable calculus) and math 21b (linear algebra and differential equations). “Teaching is something I’m passionate about,” he said. Amanda Reilly ’15 has long been drawn to the intersection between math and science. Between her junior and senior years the applied math concentrator spent the summer doing “white lab coat” research in Botswana, focusing on HIV. The experience got her interested in infectious diseases and influenced her decision to do her senior thesis on cholera. As a Fulbright, Reilly will be based at the University of Los Andes in Bogotá, Colombia where her task will be to help assess the efficacy of a needle exchange program that was recently established to combat HIV among intravenous drug using populations. The work will involve visiting needle exchange sites to collect data that can be used to construct a model. Language should not present a barrier. Having grown up close to the Mexican border, and lived in Chile and Spain, the San Diego native is fluent in Spanish. So what will come after their return to American shores? Reilly imagines two possible paths: a graduate program in infectious diseases, perhaps at the Harvard T.H. Chan School of Public Health; or medical school. After this story was published, a fourth SEAS undergraduate was notified that she had been awarded a Fulbright. Emily Savage '15, who will complete the Biomedical Engineering AB program later this month, is headed to Taiwan in August. There she will teach English to students at an elementary or middle school. Savage, who learned about her Fulbright selection from an email that arrived while she was at her part-time job at the Harvard Branch of the national nonprofit Health Leads, selected Taiwan after studying Chinese while at Harvard. "One of my teachers was from Taiwan and I loved hearing her talk about it," said Savage, who has visited Beijing and loved the experience. "Some of my TFs referred Taiwan as a part of China and some of them thought of it as its own country. I thought that dynamic was very interesting." Her Fulbright fellowship means that Savage will defer for a year starting work at Bain's San Francisco office. Having spent the last two summers working in labs-an immunology lab at Harvard Medical School, and in Professor Conor Walsh's Biodesign Lab where she assisted on a project to develop a robotic glove-Savage said she is "ready for something different." "I am interested in the business side of biotech," she said. "I don't want to be a doctor, but I am very interested in health care technology - figuring out how we can fix those systems. The excellent thing about engineering and why those firms [like Bain] love us is that the problem sets we do and the way we're taught [at SEAS] allow us to solve any problem." Longer term, the Bethesda, Maryland native has aspirations to start her own company. "I believe the health care space has a lot of improvements that need to be made. I think that is where I'll end up."